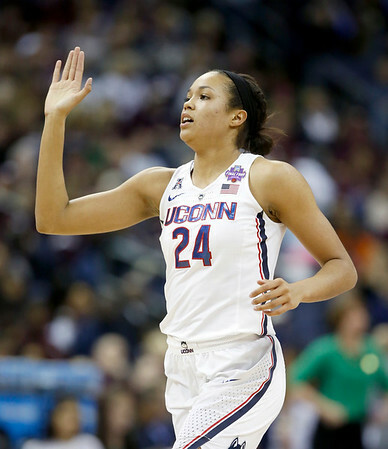 STORRS - Napheesa Collier has always let her actions speak for her. It has allowed the UConn women’s basketball team’s forward to be a 2017 WBCA All-American as well as a two-time all-American Athletic Conference first-team choice. But as she enters her final season with the Huskies, the talk around Collier is that she has to talk. The St. Charles, Missouri, native is one of just two seniors on the roster along with two-time All-American Katie Lou Samuelson. Stepping up on the court has never been an issue. Collier ranked in the AAC’s top 15 in scoring (ninth at 16.1 points), rebounds (seventh at 7.4), assists (15th at a career high 3.3), assist-to-turnover ratio (fifth at 2.2), field-goal percentage (fifth at 58.3), free-throw percentage (eighth at 78.6), steals (14th at 1.6) and blocks (third at 1.7), as a junior. In five NCAA Tournament games, she averaged 20.8 points on 67.7 percent shooting, 7.2 rebounds and 4.0 assists and earned her a spot on the all-Final Four team. On Thursday, she was named to the watch list for the Katrina McClain Award that honors the nation’s top power forward. Collier was a finalist for the honor last season that went to Oregon’s Ruthy Hebard. Collier enters her senior year with 1,609 points and 808 rebounds and is on pace to become the fourth UConn player with 2,000 points and 1,000 rebounds (joining Tina Charles, Maya Moore, Rebecca Lobo and Breanna Stewart). Last month, she was a finalist for the United States senior national team, coached by South Carolina’s Dawn Staley, that won the gold medal at the FIBA World Cup. Being with the professionals forced her to speak up. While she tried to be vocal on the court, she spent time speaking to former UConn teammate Morgan Tuck. Tuck, of the WNBA’s Connecticut Sun, made her first senior national team roster and earned gold alongside fellow ex-Huskies Sue Bird, Diana Taurasi, Charles, and Stewart. She wants to use everything she’s learned to help UConn to a 12th consecutive NCAA Final Four bid and record 12th national championship. The Huskies play their first exhibition against NAIA Vanguard on Nov. 4 at Gampel Pavilion with the regular season opener a week later versus Ohio State. “Phee has done a good job emerging as a leader,” Samuelson said. “I think us working together has been good because we complement each other well. We’ll talk off the court and figure out stuff we need to bring back to the team and figure out what we need to address. She has been with me all along the way. Posted in Newington Town Crier, UConn on Friday, 26 October 2018 22:24. Updated: Friday, 26 October 2018 22:26.